This is a painting I just completed inspired by a photo I took a year ago. Have you ever had a photo that sits and screams at you to be put into paint? 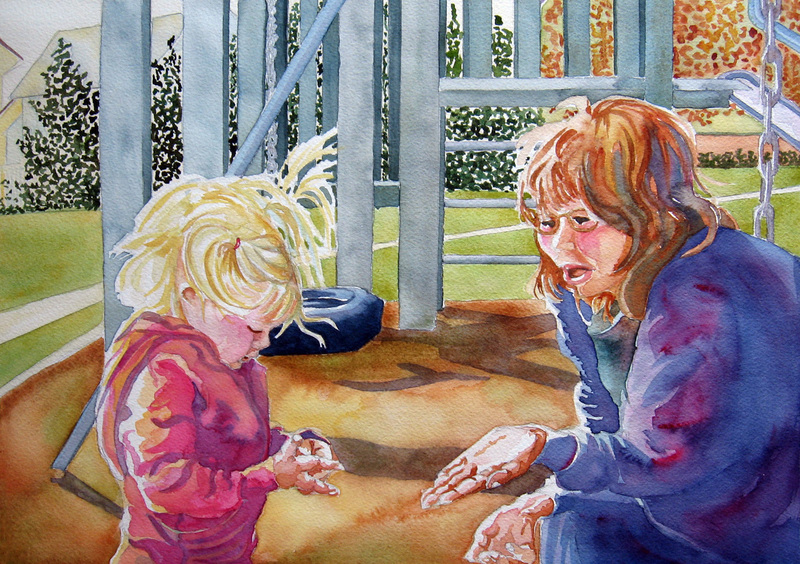 I have a collection that tell stories.The stories of everyday life, and I don’t paint enough of them. I think it is one of the most difficult things an artist ventures into because the moment and the story need to find a connection. That said, I praise all illustrators who sit down to work each day and try to emulate what someone has written and make that “special” connection that they do. I am going to let the painting speak for itself. I just drew and painted, nothing really special about technique, just enjoyed the translation of the moment. 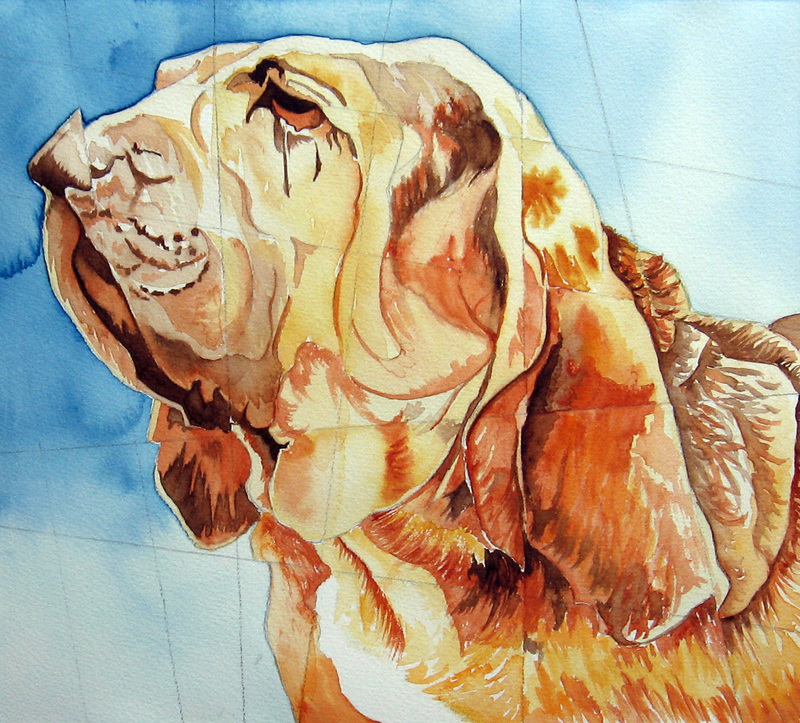 The above painting was started by my drawing the bloodhound with one continuous line. If you have followed my blog, you have seen several drawings where I use a continuous line approach. 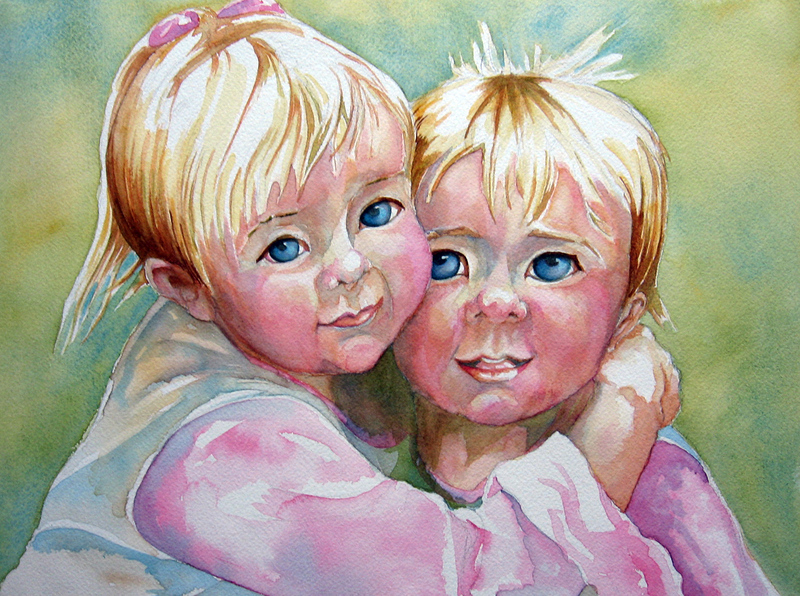 I then painted the colors and worked the watercolor in using the wet in wet approach to achieve the effects I wanted. I left highlights white like I have spoken of in several posts recently. I painted on hotpress paper, a non-textured surface. It was a joy to incorporate many of the things I have been studying into one painting. This led me to thinking about the work we all do, specifically in regards to art and different interpretations. 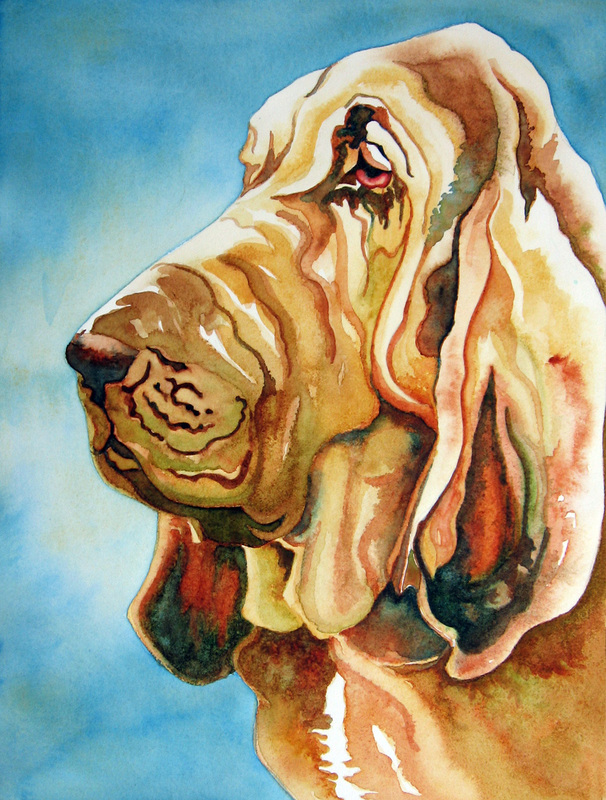 I have painted this very same bloodhound differently using another approach. In this version, I had placed a grid over the reference photo and then drawn a very distorted grid with the same number of spaces on my coldpress paper. Two completely different interpretations of the same dog! I suppose, to some, this is not such a wonderful discovery but I think it is a marvelous thing to remember when we sit down to create. I rarely paint the same reference the same way each time, even if I try. When I view all the art there is available on these art blogs, I keep this in mind. I enjoy the journey of everyone’s individual take on an inspiration whether it be in writing, photography, two-dimensional or three-dimensional art. You ALL teach me and ENTERTAIN me! I thank-you for that!!!! 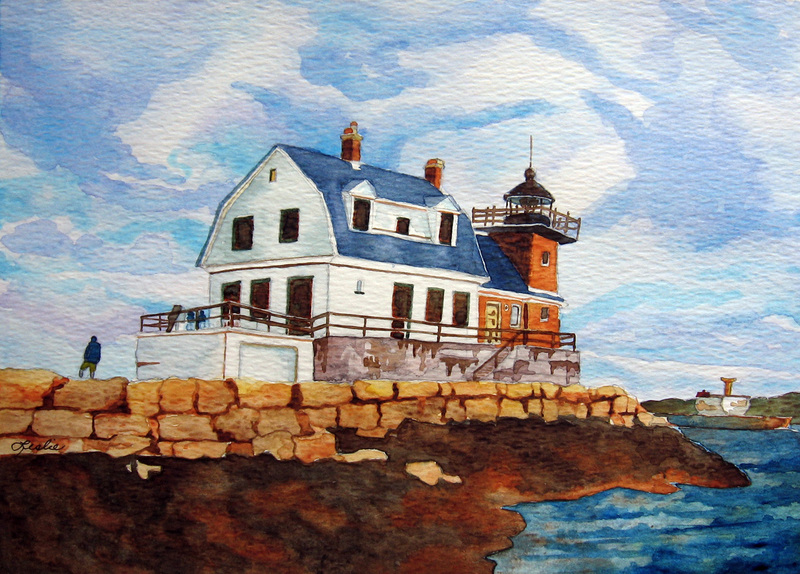 If you would like to view all lighthouses that artists completed for this challenge, click here and then on each comment as they are most likely artists who have work posted. 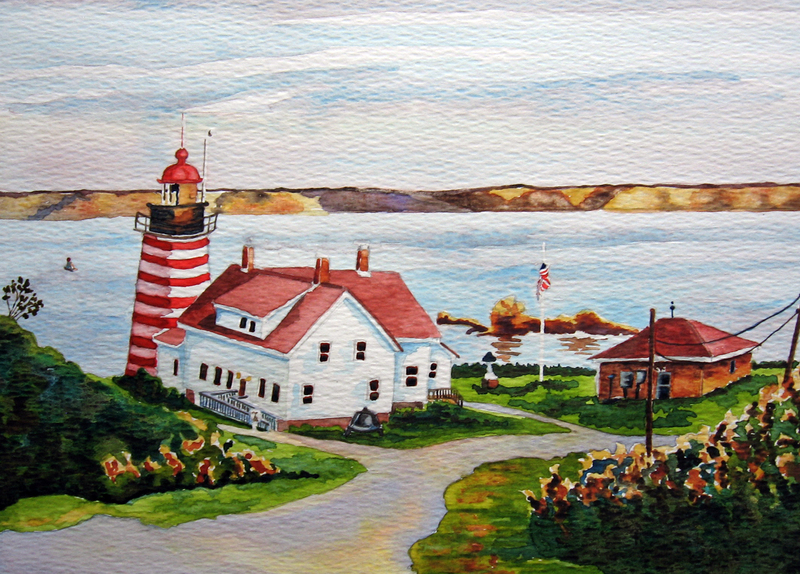 I found two other lighthouses in my travels who may not have painted them for the challeng as they did not reference his challenge. They are here and here. This painting was a little more difficult for me. I rarely paint on hot press paper. I need to keep developing some skill in this surface because I like how the pigment soaks in and stays. I also like that I can scumble and get neat wet effects with it. 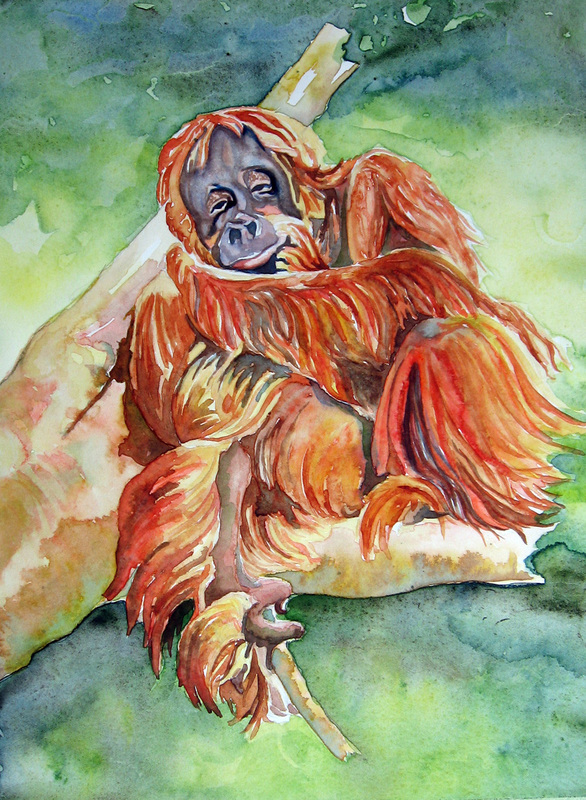 It carries a brushstroke very well as evidenced in Melati’s coat. If I was a beginner, this surface would not be very forgiving as I find that it has very little lifting properties. However, there is a positive way to look at that! 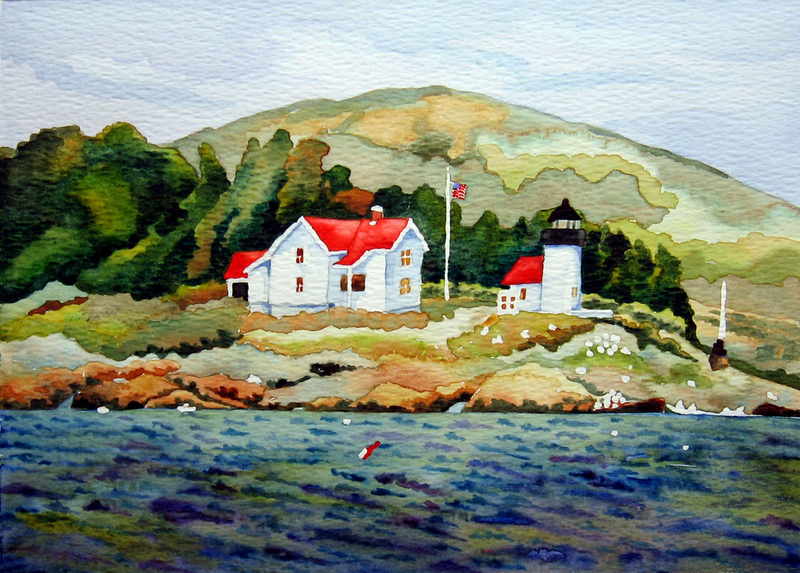 It might teach us to look for ways to improve and to look for those “happy accidents” that watercolor often gives us. Have a good week-end everyone! 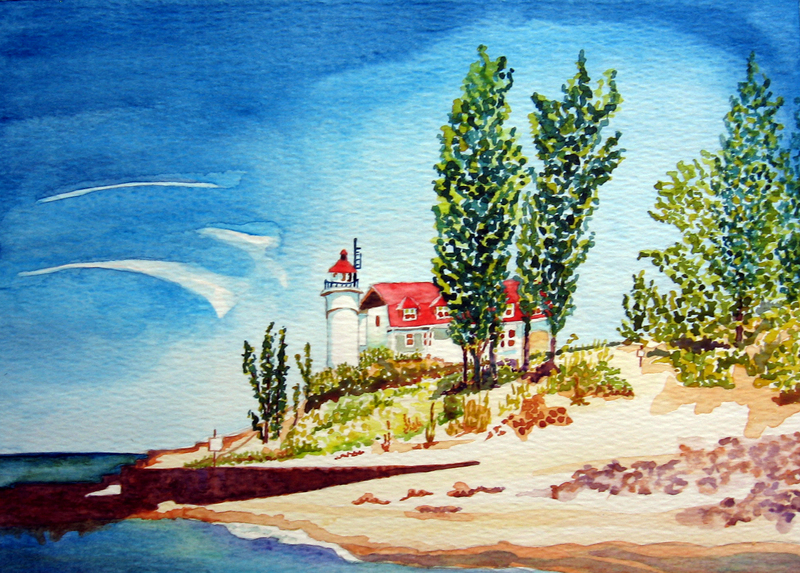 See you, Monday, for Richard’s Lighthouse Challenge! Originally introduced, here. Ichabod, has honored me by using Melati as an illustration for a beautiful poem he has written, here. Love this dog! I was recently asked to try and paint Penelope. When I received a picture of her to use as a reference, all I could think was, “How am I going to get the freckled or brindled look to her?”. The next thought was,” I have tried neutral tones before and struggled, here!” I had a horrible time trying to figure out other colors that went with them and still allowed the image to stand out. I was also asked to add a paw because Penelope often lays with her paws crossed but her owner was not able to get her to cross her paws when she took the reference photo. The longer paw in the left lower quadrant was in the photo. The right paw was added. First issue was placement and the paw. I scanned the reference photo and saved it to my computer and flipped it in photo shop and tried a drawing with both paws the same as the one in the lower left quadrant and that looked awful and really distorted as I learned I would need to take into consideration her ear on the added paw side as well as her cheek and jowls. Sooooo to make a longstory short I drew separate sequences of paws and crossed my own little dog’s paws (poor Lucy) to see how she might look in various crossed paw configurations. The above result was what I went with because it looked the most believable. I decided that I might be able to achieve a freckled look to the dog’s face by using salt. I have used it successfully, before, in paintings. That worked for the texture and speckled look, but I had to paint a little, drop salt, paint some more, drop salt and constantly keep my eye on what it was producing while still wet so I could make any corrections that might be necessary before it dried. As I worked, I began to notice a flat quality with the neutral colors I was using so I mixed in blues, rose and some medium greens and that gave them a rather bold look instead of the flat look I was getting. 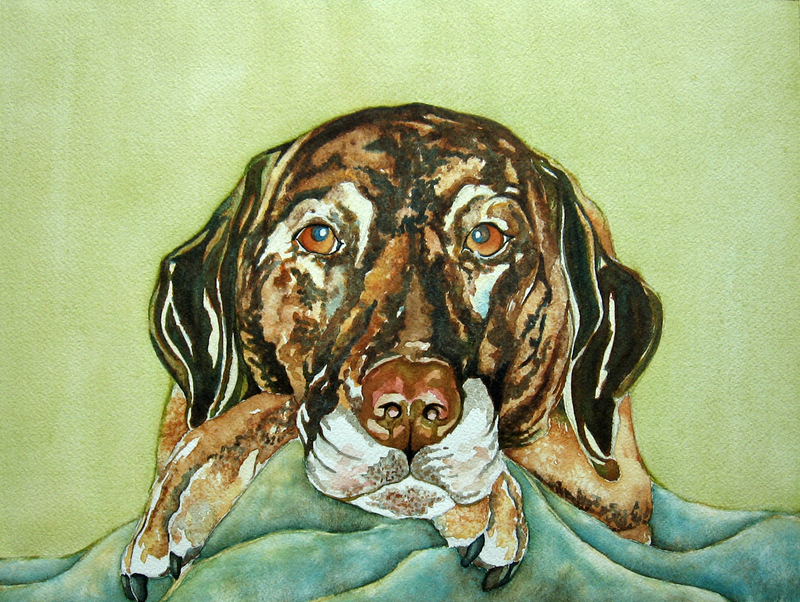 I worked the dog and the blanket together before starting the background. I learned from my highland cow experience that too much color for the background would bury this neutral image so I went with a light green and yellow look to keep her image prominent. I textured the blanket by re-wetting the folds ( after the initial layers of color had dried ) one at a time, and dabbing each wet fold with a textured paper towel. The last thing I did was go back into the dogs face and ears and reaccentuate the darks with van dyke brown and some winsor green. I learned a lot from painting Penelope’s portrait and I thank her owner for offering me the opportunity to paint her! I have a climbing rose on the north side of my yard that blooms but once a season with large multiple blossoms against my picket fence. 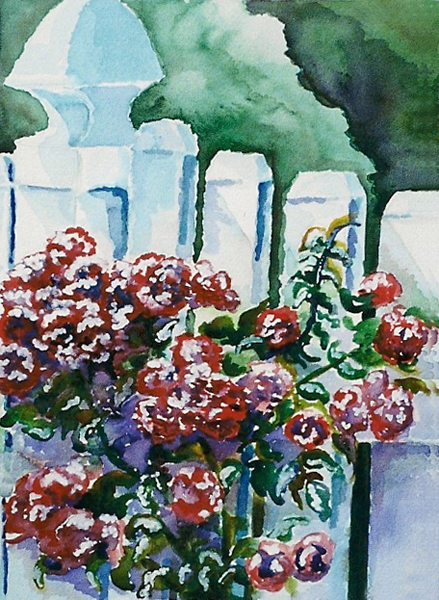 This is a plein air of them while sitting on my patio. 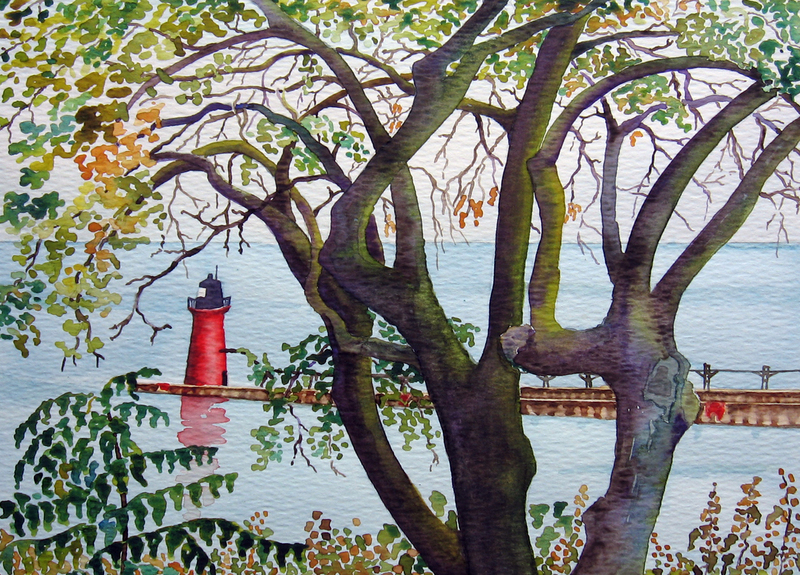 Beth Parker has effectly introduced sunlight into her painting, here! If you’d like to view Don Andrews work, it is here.